Following their nomination by the NZ Police for search and rescue efforts in Aoraki Mount Cook National Park, The Helicopter Line has been awarded an NZSAR certificate of achievement. Transport Minister Steven Joyce awarded them the certificate at the 2010 New Zealand Search and Rescue (NZSAR) Council Awards in Wellington yesterday (14 April). The Helicopter Line (THL) was among just four in New Zealand to receive a certificate of achievement specifically for its services, leadership and dedication to Alpine Search and Rescue at Aoraki Mt Cook. Police Constable Brent Swanson of Lake Tekapo initially nominated THL and was seconded by the Department of Conservation (DOC). The NZSAR Awards are presented annually in recognition of outstanding achievements in the New Zealand Search and Rescue region. Lead Pilot of The Helicopter Line Tony Delaney has been one of the main contributors to the rescue missions of the company for several years and was in Wellington with CEO Mark Quickfall to pick up the certificate. “The Helicopter Line is predominantly a tourism flight operator and its commitment to search and rescue does not offer any significant financial gain however there’s no doubt the company’s 30 years of commitment and ongoing dedication to search and rescue has saved many lives,” he said. In 1977 the first Memorandum of Understanding was signed between The Helicopter Line and the New Zealand Police which confirmed THL’s commitment to providing strop pilots on standby and providing financial assistance to training. THL CEO Mark Quickfall said it was an honour for the whole team to receive recognition for their efforts over the past three decades. “We work with NZ Police and the Department of Conservation (DOC) so to be nominated by our colleagues is fantastic. The company has had great input into developing and improving strop rescue techniques and equipment so this is a fantastic achievement,” he said. 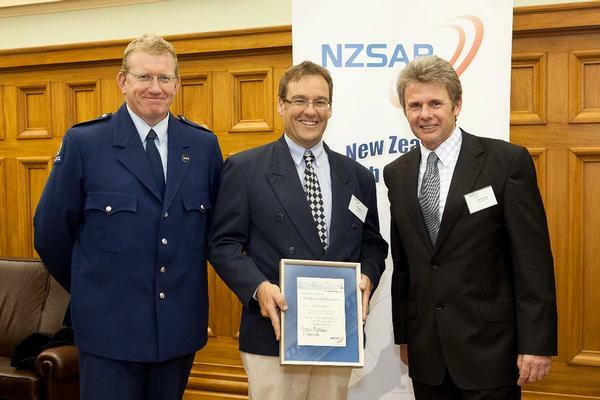 The overall Gold Award for the most significant contribution to NZ Search and Rescue in 2010 went to Captain Greg Lyall and his crew of fishing vessel Amaltal Atlantis for the rescue of crew from the Oyang 70 on 18 August 2010. For more information on The Helicopter Line visit www.helicopter.co.nz.